The two day sessions are open to art professionals, art teachers, curators and art students. Participants do not require any prior skills or knowledge and do not need to prepare. Speculations is a two day Shift/Workshop. Speculations will be collectively composed and play-tested at Edinburgh Sculpture Workshop on the 3rd and 4th of March 2017, a participatory action-research workshop ordained to fabricate speculative artistic research methods. What will we be ‘composing’? We will compose a workshop in which participants develop, learn and apply speculative artistic research methods. It is crucial that the genesis of this workshop is, in its own right, speculative. Our speculative process encourages artistic practices that cannot be held, observed‌ or enacted without taking risks or experiencing their consequences. To this end, Shift/Work: Speculations will be collectively composed. Speculative methods may include, but are not limited to: abduction, syncretism, forecasting, futurism, divination, becoming-rites, probing (making and employing actants), paradisciplinarity, ‘pataphysics, hyperstition, theory-fiction, mythopoesis, fabulation, fictioning, (mis)management, gaming / playing, versioning, licensing, servicizing, technés / technoetics, extended cognition (ExC), imaginative propositions, paper architecture, thought experiments, proposing, lateral thinking/feeling/knowing, weird-ing, speculative realism, mangle-practice…. A compagon of ‘composers’ – comprising artists, curators, designers, musicians, producers, educationalists, social anthropologists, philosophers and futurists – will join us at Edinburgh Sculpture Workshop in March 2017 to scribe and audition Speculations. Working in three groups, participants will compose three iterative workshops. The three groups will then rotate, each participating in the workshops composed by their peers. Our post-workshop re-calibration of the three workshops will translate them into one workshop. 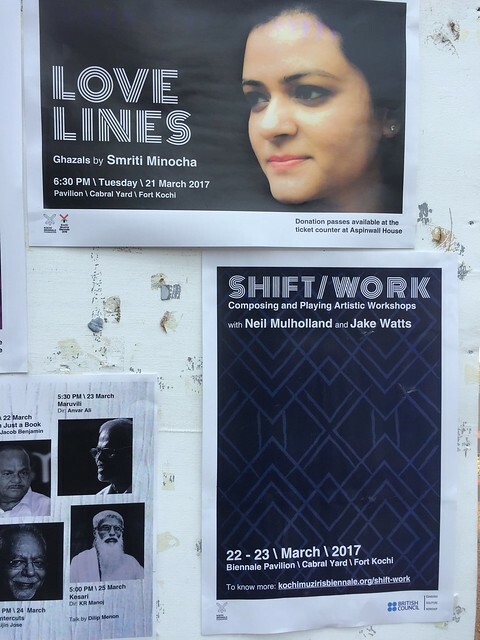 Shift/Work will direct this ‘calibrated’ workshop at the Kochi-Muziris Biennale at the end of March 2017. At the time of writing, we may only speculate on the form Speculations will take. We speculate that the workshop will enable participants to compose, experience and evaluate an iterative, action-based, peer-to-peer learning experience that is both theoretical and practical. We expect they will learn how their speculations (and their attendant risks and uncertainties) are co-affective upon the experiences of their peers. Like previous Shift/Workshops, Speculations will enact relevant discourses, practices and models of artistic paragogy to enable and inspire participants to adopt speculative methods and implement their own workshops. We hope that you can come to ESW to take part in the composition phase of this workshop. NB: If you are able to particpate for only one day, please contact us to let us know. What’s a studio & how do we use one? In a climate of economic instability, and at a time when artistic practices are continuing to diversify, the symposium aims to explore a number of modes of studio practice. How does exposure to different models of the studio within art school impact on how artists use a studio upon graduation? How do studio groups differ in their support of artist’s practices? What is the relationship between artists and their assistants? Speakers include a number of prominent art educators; studio groups from a range of different cities; artists and academics who will discuss the practices of artists who employ teams of assistants within their studios.